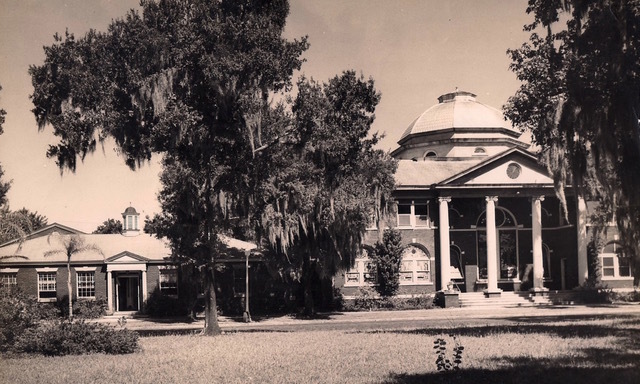 The First United Methodist Church of Sanford is currently housed on the corner of Park Avenue and Fifth Street in Sanford, Florida. It was established in 1874 has been housed in various locations and buildings. The first structure for worship in this location was a wooden building moved from the corner of Sanford Ave. and 6th St. in 1892. On Easter Sunday, 1914, the last service was held in that building; it was torn down in order for construction of this structure to begin. During construction, services were held in the Star Theatre on 2nd Street. 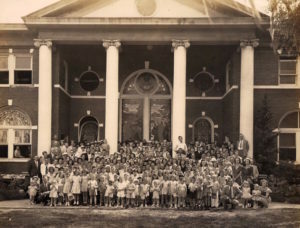 The cornerstone was laid on August 11, 1914 and, even though the building was not yet complete, arrangements were made for the congregation to meet beginning October 24, 1915. Stephen O. Shinholser, church member and contractor, constructed our sanctuary using a design by architect J.B. Greene in a style known as the Akron Plan. Akron Plan churches typically have an auditorium form worship space (rotunda), surrounding, connecting classrooms accessible via the first floor or balcony, and no center aisle. This design promoted the “fluidity and efficiency” of churchgoers moving between Sunday school and worship. This design fell out of favor after the 1920‘s and most surviving Akron Plan churches have now been altered beyond recognition. Fortunately, this beautiful historic structure continues to honor its past without altering the architectural design of the building. Green’s Greatest Efficiency Plan as a guide for ventilation was also utilized during construction. There are 37 stained glass windows total in the building, including those behind the choir loft, in the chapel, narthexes and the bride’s room. There are 3 windows in the bride’s room that are not stained glass. As you would imagine, many of the persons listed on the windows inside the sanctuary were from families in the church at that time. Not all of the windows were installed or named in memory/honor of someone at the time of construction. 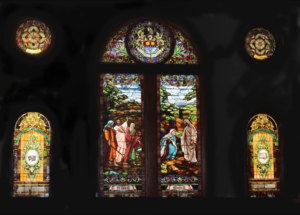 Many were installed a a later date or without name plates; the final two windows were purchased from and installed by Stained Glass by Shanendoah in the early 2000s.